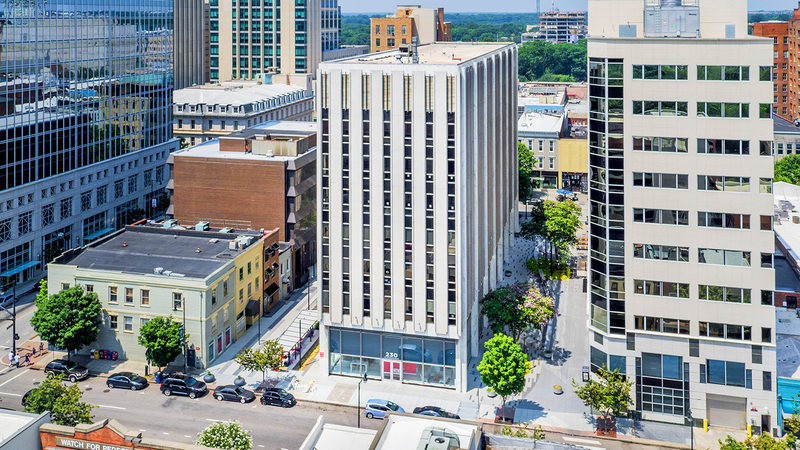 227 Fayetteville is a newly renovated, 10-story high-rise mixed-used office building located in the heart of downtown Raleigh. Formerly the regional headquarters of Wachovia Bank, 227 Fayetteville has more than 100,000 of rentable square feet, as well as prime retail frontage on two of Raleigh’s main streets: Fayetteville Street and Wilmington Street. The mid-century modern iconic design is a highly visible brand in the downtown district, which is the most sought-after location for entrepreneurial and legal businesses. Close proximity to the new HQs of Red Hat and Citrix buildings make 227 Fayetteville a desirable location for businesses looking for space in the city’s hottest area. Efficient floor plate with full floor column–free space provides high window–to–floor ratio. 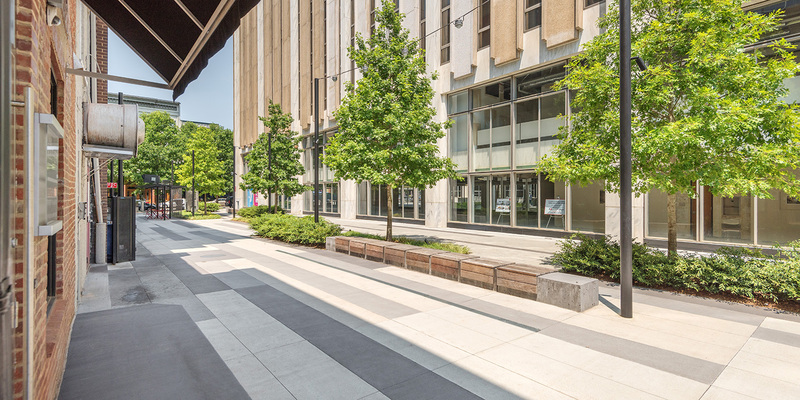 First floor retail space with 30–foot glass storefronts has frontage on two of the city’s main streets: Fayetteville Street and Wilmington Street. Building is conveniently connected by an underground passageway to a 700+ space municipal parking facility and will have 300 spaces allocated for parking. Mid–century modern iconic design featuring exterior marble columns with steel and glass detailing. Exterior marble columns extending from grade to the top of the building create a strong framework. Up–to–date new internal control systems – new destination stop elevators, HVAC, communications, data, fire and life safety. State-of-the-art telecommunications hub provides secure and redundant fiber optics and cloud connectivity. The City of Raleigh is upgrading Market and Exchange Plazas with new surfaces, design and landscaping that border the building on the south and north sides. 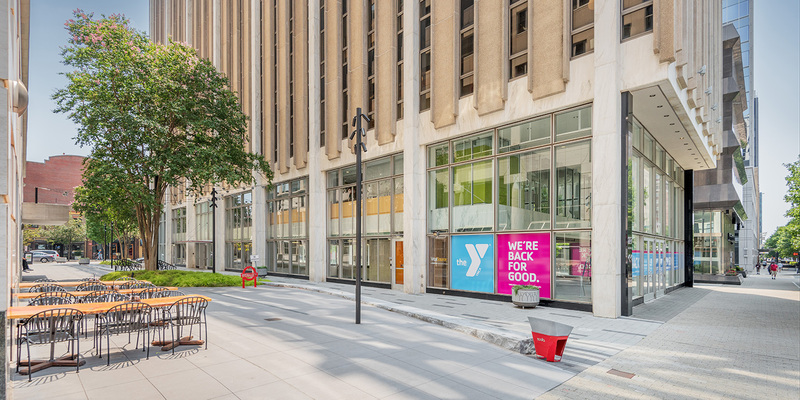 Located in the heart of downtown Raleigh, NC between the State Capitol and the North Carolina Performing Arts Building in the HUB of all activity. Highly accessible with frontage on two of Raleigh’s main streets –– Fayetteville Street and Wilmington Street within walking distance of over 20 fine restaurants, bars and other amenities. Conveniently located near the State Capitol, County Courthouse, the newly opened Convention/Civic Center and residential units under development.